Today’s stunning contemporary kitchens demonstrate the best of the best in time-honored kitchen design elements, as well as the most cutting edge smart technology and more. As Phil Kean says, “The evolution of kitchen design through the decades gives our clients a remarkable range of evolved design elements from which to craft their personal contemporary kitchen. Each period is inspirational in its own right.” Here is a look at how we got to the here-and-now as modern kitchen design evolved over the decades. Imagine cooking with no electricity and no running water. Kitchens of centuries past involved a great deal of physical labor in order to even start the cooking process! Yet design elements from medieval, old world kitchens and pre-industrial age kitchens, like antiqued woods, metals and natural stone, still have a place in today’s forward-thinking kitchen designs. According to LuxPad, “Cooking in the Middle Ages was, like today, a sociable and communal affair. As the only source of light and heat, all activity revolved around a central fire.” Tables and seating were a part of cooking and family life even then. However, that changed as increasing travel brought new cuisines into the picture. For the wealthy that meant separate kitchens to support lavish feasts. For working families, the kitchen also became separate and primarily functional. “It was a sign of poor hospitality for any sounds or smells from the kitchen to permeate the rest of the house.” Thank goodness for the Industrial Revolution! By the early 1900s, household electricity and running water were the norm. Industrialization brought the evolution of kitchen design to a new era. Factories mass-produced fixtures, ever-more modern appliances, cabinetry, lighting and storage units, and gas stoves were introduced. In the 1920s, the kitchen design hit a new high. An Austrian architect, Margarete Shutte-Lihotzy, revolutionized the Frankfurt Kitchen, a prototype for the modern kitchen introduced the “golden triangle” of cooker, fridge and sink placed for maximum efficiency. It was such a design innovation that in 2011 the Museum of Modern Art created an entire show around it. Through the 1940s these integrated cooking spaces dramatically influenced the course of kitchen evolution. In the 1950s, the modern kitchen design truly took off. New products such as laminates and linoleum hit the market. Paint color became a fashion statement. International design influences became more prevalent. However, one of the biggest movers and shakers behind modern kitchen design becoming all the rage, was perhaps the first pop culture celebrity chef, Julia Child. With an enormously popular TV show, gourmet cooking became a fast-spreading craze. Yet kitchens were still closed off rooms. The open plan kitchen, a concept by architect Frank Lloyd Wright, was still rare in the 1950s, but many mark the ‘50s as the decade that paved the way for their rise to popularity. 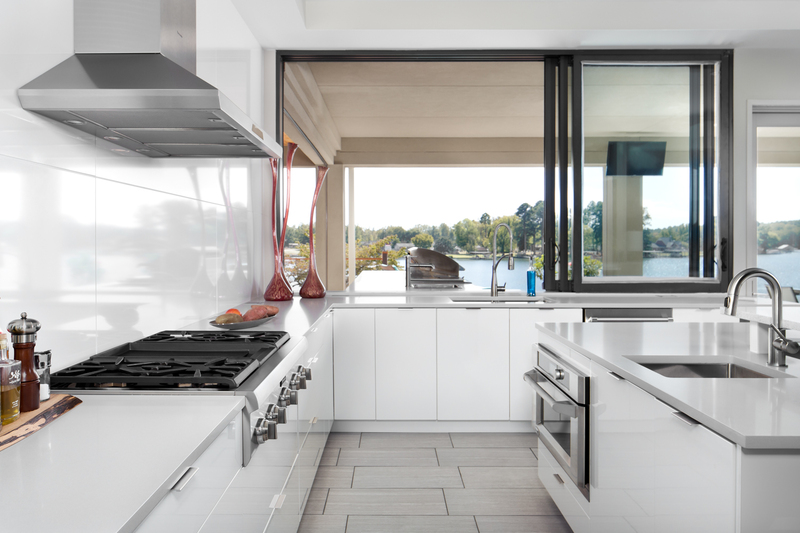 By the 1980s, open kitchen designs were the darlings of architects and their clients worldwide. From mass-produced family houses to the most luxe of custom home designs, the open kitchen plan was here to stay. Contemporary open kitchen styles have made the kitchen island a mainstay design element. Both stylish and functional, kitchen islands themselves have evolved to become a focal point for socializing and entertaining as well as truly establishing the contemporary kitchen as the heart of the home. Islands and peninsulas can define areas of the kitchen and delineate cooking zones with built in cooktops, sinks and prep stations for home chefs to show off their talents, as well as comfortable gathering places for conversation, dining and even homework. Additionally, Phil Kean and his design group have been leaders in extending the evolution of kitchen design that transitions from indoors to outdoors for a seamless experience that brings the evolution of kitchen design right into 2018 and beyond. For more information about custom gourmet smart kitchen designs contact Phil Kean Kitchen & Bath LLC to schedule your private consultation.